Had ekklesia been correctly translated into English from Greek, the divisive myth that Yeshua (Jesus) came to start a new religion called Christianity would’ve been a much harder sell, at least to Bible readers. The second problem with the myth that the so-called church was born at Pentecost is that it simply is not Scriptural. On Pentecost (Shavuot), one of Yahweh’s Feast Days, which commemorates Yah’s giving the TORAH to Moses, all Israel was to appear before the LORD at the Temple in Jerusalem. By the first century, of course, only Jews (Judah, Benjamin, and those Israelites like the Levites who assimilated into the House of Judah) were in the Land. The northern tribes, those Yeshua referred to as the “lost sheep of the House of Israel,” had not returned. Now many translations (like the KJV) say repent and “be converted”, but this is another one of those sly translations meant to give the idea that believers were to believe something “new.” The Greek word, however, is met-an-o-eh’-o (Strong’s G1994). It means to “revert or return” i.e., to Yah’s instructions, to His TORAH. Other heresies birthed in the Fourth Century by Constantine and the Roman Catholic Church were: Sunday-sabbath, Christmas, and Easter. With the codification of these changes, observance of Yah’s 7th day Sabbath and Feast Days, along with any fellowship with Jewish disciples, became punishable by excommunication and even death. It was a far cry from the hospitality shown to Gentiles coming into the faith in Israel some three hundred years before (Acts 15). “Let us then have nothing in common with the detestable Jewish crowd; for we have received from our Savior a different way.” (Eusebius, Life of Constantine, Vol III Ch. XVIII). Only Constantine did not receive “a different way” from the Savior of Scripture. For the Savior of the Bible never changes. He is the same yesterday, today, and forever. When Yahweh told Moses that the 7th day Sabbath and His Passover (all His Feast Days) were to be observed FOREVER, He meant it. And when Yeshua said that not one jot or tittle would pass from the TORAH until heaven and earth passed away, He also meant it. Yah said, “Whatsoever I command you, observe and do it! Thou shall not add to nor diminish from it.” (Deu 12:32) So if the God who never changes hated something in the beginning, He still hates it today and will hate it tomorrow. If He expected those in covenant with Him to do something three thousand years ago, He still expects it today. And since this called-out congregation, which got mistranslated into English as Church, isn’t new–wasn’t born at Pentecost–but is in fact the very same “quahal” that was with Moses in the wilderness (Acts 7:38), then Yahweh still has sole jurisdiction. His law still stands. There is One God, One Messiah, and One people of God. Gentiles can come into covenant through faith, but once they do, they cease being Gentiles. They too become part of the Commonwealth of Israel and share in Israel’s Covenants. (Ephesians 2:12) And the Jewish Messiah, Yeshua, did not come to start a new religion. He came only to do His father’s will and to speak His Father’s words. So When Was The Christian Church Born? This religion called the Christian Church was born in the Fourth Century. It is a hybrid religion, birthed through the syncretism of pagan sun-god worship with Biblical truth. It’s doctrines and traditions constitute a (spiritually) deadly mixture of good and evil, like the fruit on the tree in the midst of the Garden, from which Adam and Eve were not to eat. The creators of this hybrid religion, through their ignorance of Yah’s instructions or their open rebellion thereof, failed to heed the LORD’s warning not to learn the way of the heathen (Jer 10:2), not to worship Him the way they worship their gods (Deu 12:4). So many of today’s Christian practices are nothing more than baptized-paganism. The Roman Catholic Church proudly admits that many of their church-traditions are borrowed from pagan idol worship. Catholic Customs and Traditions, written by a Catholic (Greg Dues), for Catholics, presents an overview of the customs of Roman Catholicism. In it the author admits that Sunday worship “is an example of how culture and pagan traditions influenced Christian religious traditions. This title [Sun-day] comes from pre-Christian worship of the sun…” (pg. 22). “The choice of December 25 as the date to celebrate Jesus’ birth was an adaptation of the pagans’ December 25 celebration of the birthday of their sun god. After Constantine “became the benefactor and protector of Christianity, pagan cultural features of sun-symbolism were no longer threatening. They could be freely absorbed by the church. The church, with its Nativity date of December 25 already in place, did precisely this” (pg. 51 f). 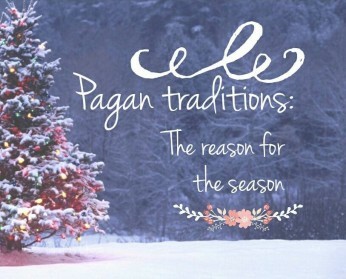 “Most Christmas traditions associated with evergreens and trees are related to pre-Christian practices… Teutonic and Scandinavian peoples worshipped trees and decorated houses and barns with evergreens at the new year to scare away demons…” (pg. 56). “The origin of Santa Clause is a deliberate mixture of a bishop-saint, Father Christmas, and the Norse mythological god Thor, an elderly, jolly (god of war), with white hair and a beard, living in the north land, who sailed the sky in a chariot pulled by goats, and as the god of fire, he was partial to chimneys and fireplaces…” (pg. 60-62). The Second Vatican Council, I must insert here, stated in the 1970s that no Roman Catholic bishop named Nicholas ever existed! Vatican II also confessed that the origin of this legend came from pagan traditions! Catholic Lent came from the forty days of weeping for the sun-god Tammuz. The Catholic custom of giving milk and honey to the newly baptized is a “practice borrowed from the pagan mystery cults…” (pg. 90). Easter eggs and Easter bunnies: “In ancient Egypt and Persia friends exchanged decorated eggs at the spring equinox… These eggs were a symbol of fertility… Rabbits are part of pre-Christian fertility symbolism because of their reputation to reproduce rapidly” (pg. 98f). The sun-goddess, Ishtar, from whose name we get the English word Easter, was said to have landed in the Euphrates in a giant egg on, you guessed it, Ishtar sun-god day. In volume III, titled Caesar and Christ, in historian Will Durantin’s massive work, titled The Story of Civilization, the author shows that in the “new” church, which developed in the Roman Empire, Yeshua lost all Jewishness. “…the god Christ was assimilated into the religious and philosophical traditions of the Hellenistic mind. Now the Pagan world–even the anti-Semitic world– could accept him as their own. If you are a Christian, who still celebrates Christmas and Easter, you need to figure out who it is that you are worshiping? If it’s the God of Scripture, you must worship Him in spirit and in TRUTH, which means worshiping Him the way He says in his word that He wants to be worshiped–which is not the way pagans worship their gods. But if YOU are actually sitting on the throne of your heart, if celebrating Christmas and Easter is about what pleases YOU, then by all means, go buy that tree and decorate it with all your heart. Now, you decide which one! Thank you for sharing this. This is very well put together. myself.and we are on the same page. Blessings from the Northern Ontario region. Most Interesting, thought provoking and definitely worth accepting into fabric of my Faith in Eternal Father God Almighty.